On the 8th Day of Running, Racing Gave to Me an 8K with PancaKes! Part of the Leavenworth Race Series and hosted by the Kansas City Track Club, the 5K/8K Cliff Hanger is definitely a popular race and for good reason: you get breakfast afterwards! Now my last entry was about NOT eating heavy breakfast foods before running – this entry is about the opposite. You should TOTALLY enjoy awesome breakfast foods on race day, but make sure it’s AFTER the race. 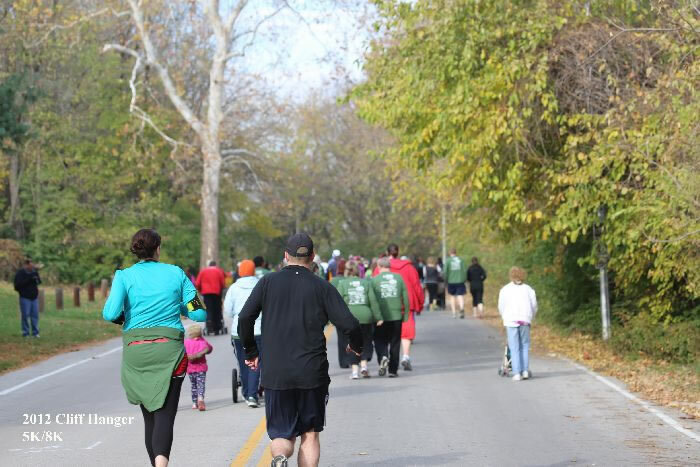 The Cliff Hanger is held in late fall (first week of Nov) and is along a scenic, winding road in North KC by the river. The course itself is completely on a road, out and back. The 5K peeps run to their turn-around point and the 8K peeps keep going farther to their turn-around point. In this aspect, the race was kind of boring for me. I do appreciate running on concrete (at least my ankles/shin muscles love me for it), but the lack of hills or any tough terrain was disappointing. However, the whole road is surrounded by trees and overlooks the river, so it’s at least a pretty route. Plus, even though there were no definite hills to see, the road wasn’t entirely flat. It was a passive-aggressive slight up and down incline that you couldn’t see but definitely felt after awhile. The out and back thing is great though: you know exactly how much further is left on the way back and know exactly how far ahead of you your competition is. I waited Jason out on this one. I stayed right behind him the whole 8K, banking on my longer-distance endurance to help me pull out a win. My patience paid off: with 100 meters or so left, I kicked in the energy I’d been saving by keeping slightly behind him and managed a victory by just a few seconds. It was sort of a sneak-attack ninja runner move – perfected from years of pacing behind my prey during track meets. But everyone wins in this race: besides AWESOME tech t-shirts, Chris Cakes caters the food afterwards. Also, this race is divided into two start times. So if you’re a late riser, you can start at 9am instead of 8am. Also, the 8 am start time is geared for more competitive, faster runners who appreciate a less crowded course (anyone running a 9:30 min mile or faster). Also, you have two distances to pick from 5K (a.k.a. you deserve pancakes) or an 8K (a.k.a. you deserve even more pancakes). But back to the food: Chris Cakes is a local catering company that has this interesting apparatus they bring with them. It’s a loooooong griddle on wheels. At one end is a rectangular mechanical arm – the cook moves the arm over the griddle and squeezes and SPLAT! Four or five rows of pancake batter sizzling on the surface. The cook continues moving the arm down the griddle. Once the pancakes are ready, you better be ready. Besides their patented pancake cooker, they’re known for flipping you the flapjack. 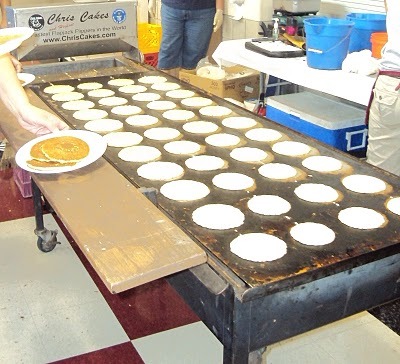 Stand back, hold your plate, and get set to catch your pancake prize! These are flipping delicious! And taste ten times better after a hard run! Chris Cakes also was serving sausage too – protein and carbs! The perfect recovery combo! The owner and founder of Chris Cakes used to go to our church. On several occasions he hosted pancake breakfasts/fundraisers there – it was cool see how much the company has expanded since then. They now have several employees, not just family, and several of the brilliant pancake griddle machines. Come check them out in this awesome fall run. Besides food, this race also gave me the lesson of remembering to pace. Running an 8K is different than a 5K – by almost 2 miles. Instead of going all out and hoping I could stand not breathing for twenty-some minutes like in a 5K race, I had to hold back some and remind myself I needed to breathe for 2 more miles. So if you want something different from the usual 5K and to push yourself a little farther, definitely do the Cliff Hanger. You won’t leave disappointed or empty handed (er, stomached). Posted on March 7, 2013, in Food, Going Local, Humor, Lessons, Races, Recommendations, Running and tagged Chris Cakes, Cliff Hanger 5K, Cliff Hanger 8K, Humor, Kansas City, Kansas City Races, KC Track Club, KCTC, North KC, Pancakes, Running. Bookmark the permalink. Leave a comment.